Pre-baby our house in London was pretty tidy, and I would consider to myself to be house proud. Don’t get me wrong I still am, but in different ways. When we bought our home, we spent thousands of pounds re-doing the kitchen, bathroom, garden, painting and decorating. We would put our hearts and minds into sorting out the house, making it the home that we wanted. There are certain areas that need a lick of paint or need sprucing up which have remained this way for some time. I don’t know why but our weekends are so full, and the last thing my husband and I want to do when we get home from work is repaint a wall in the kitchen. With all the hot weather over the Summer and little rain our garden is looking a little over-grown and wilted at the same time. It is longing for a full day of hard graft to put it back to its rightfull state and give it the love it deserves. I am also really annoyed with myself that I’ve not collected the damsons from the trees to make damson gin and vodka this year. Every single week I find myself with a huge pile of clean laundry to put away. I really need to get better at this, by putting away each wash as it comes of the drier. Maybe I need to become more organised and have separate clean laundry piles for me, my husband and my daughter. The kitchen is the only room in our house where we can create a play-room, or baby jail, for our little one to remain trapped. This is vital for the day that I work from home. However it also means that we have a huge play pen permanently sitting in the middle of the kitchen. I have placed this strategically so there is enough room to access all cupboards, open the dishwasher and oven, and open our back doors to the garden. The larger walker toys that we own all reside in the living room as there is space for our daughter to play and climb. This does mean that there is no living space in our home where I can escape the coloured plastic. The description says it all, my freezer is full of toddler sized portions. Before I had our daughter I made a huge effort to cook meals in advance. Now I am doing exactly the same for our daughter, so that when we get home from nursery I can quickly re-heat a meal in the microwave for her dinner. This is what inspired me to write this post. The other day when my daughter was napping I went to turn on the TV. Instead of going to channels or a program that I would watch, I instantly went to channel 121. I am like a stealth bomber in my house. I know exactly where every creak is, and how to tread without causing our floorboards or wooden stairs to creak. I discovered this new tactic during the 4-month sleep regression, where one false move would cause the baby bomb to go off. This is an odd one as you would expect it to be dirtier. However last week I realised it was probably the cleanest floor in the entire house as it is cleaned with dettol at least 4 times a day. When our little one started crawling she was obsessed with getting to the house plant, taking out the soil and eating it. To prevent this, I’ve created a round cardboard disc that fits across the plant pot, with a hole for the plant, and a liftable flap for watering. This is quite a random list of ways in which your home and home life changes once you have a child. I hope if you’re reading this you can relate, or can share other ways in which your home life has changed. I wouldn’t change it for the world, and in this day and age we can throw money at these problems to get decorators and cleaners to come into our homes to make it exactly the way that we want it to be. I am incredibly lucky to have a lovely home, where I live with my husband and daughter, and there will always be changes that we want to make to it. I would love to hear from you on how your home life has changed since having children. Haha! The creaks one I totally get too. You need to know where to dodge in the night… And you should seriously patent the cardboard flap for houseplants – genius. Our changes would be… huge steriliser, blender & bottle area on the kitchen side. Toys in our bedroom for morning play… Jumper taking up the ENTIRE lounge etc etc ! Kimberly recently posted…Shhhh… 10 reasons I re-love the library. Sounds like you have a great house. Mine was never particularly tidy pre-children so I was glad I could blame the mess on them lol. This is so true! My living is full of toys that are too big to hide, at bedtime I just have to ignore them! Kate Orson recently posted…When you want a break from parenting, this is what you might really need. Sam recently posted…​Woe is my Wisdom Tooth.. Some of these sound so familiar! We have a playpen in the corner of our lounge and the assortment of plastic cr*p in front of the fire place. I also clean the floor around the highchair several times a day. I’m quite surprised there is any flooring left! We also have a tonne of fresh fruit in the fridge at every given time for the small toddler-shaped food hoover we now possess! I never used to buy berries and ready-to-eat kiwis pre-child because I thought they cost too much. But they make like far easier as I know they are ready to eat. I’m holding out that it will get easier to do things as the years pass and children require less monitoring. Sure there will be different challenges but even as we approach my LO’s second birthday I am able to do more with her around. I can totally relate. I never catch up with my laundry and CBeebies is our most watched channel! Haha I love that your plants have cardboard protectors over them… I can’t keep a plant alive! The washing is just never ending, I swear we have mor children living here than I know about! An an extra husband…. how can one man create so much washing? haha this is so true especially creaks in floor boards! we knew EXACTLY where not to tread during the night! Emma me and b make tea recently posted…Cauldron Toad in the Hole for Halloween! Swap cbeebies for Peppa Pig and you could be describing our house. I don’t think you could possibly go into a parent’s house and not see evidence of the child. It’s impossible. We are quite lucky that we have under stair storage in our living room so straight away that was designated for Ethan’s bigger toys. Along with an ottoman that keeps them a little bit organised and spacious enough so he can walk in and find what he wants. The other thing I use in the living room for all his cars, farm animals, Lego etc is the living room friendly storage boxes. They look like normal furniture as the canvas boxes match my colour scheme but they keep the toys hidden – and sadly enough I know what’s in each box! Oh, I love the way you write! This post had me chuckling! Especially about the floorboards. That’s what it’s like when I visit my sister at the moment. SHe has a 1 yr old and 3 yr old who are not very good sleepers and she is so worried about waking them or making ANY kind of noise that it stresses me out a bit when I visit but she is so exhausted I don’t want to tell her it doesn’t have to be THAT quiet! We have to watch the telly on such a low volume that I can hardly hear it and we whisper! Then I have to walk up the edges of the stairs and the guestroom has so many creaky floorboards I end up trying to jump to the bed from the doorway!!! Honestly, its like a comedy sketch. No one flushes the chain. I was freaking out when my electric toothbrush was too loud before thinking how ridiculous it all was….You can’t really tell that to my sis when she is so absolutely exhausted so I just have to go through all of the motions and just hope the evening meal we have once kids are finally in bed isn’t too loud and crunchy! Kirsty – Motherhoodery recently posted…When Is ‘Just One More Photo’ One Too Many? Oh love this! My mantra – sod the house work, it will get done at some point at some time! My house proud days (hmmm, maybe I never had them!) are well and truly gone! Yes, our homes definitely change don’t they?! 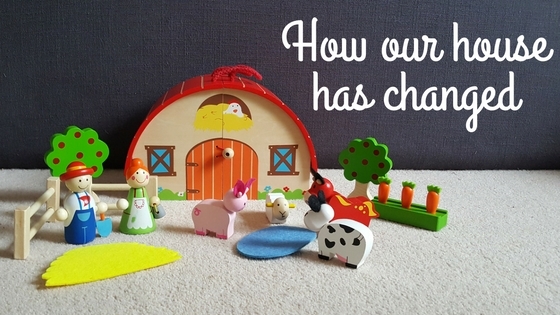 As they get older (our daughter is now 7), the toys do get more streamlined, less colourful and you do gradually get your home back!… honest! Carol Cameleon recently posted…It’s time for The Linky Linky blog linky!